Do not let your business come to a standstill when customers or clients refuse to pay. We can play roles as necessitated by your situations. We can stop the outstanding debt from turning into bad debt. 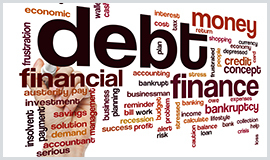 Our debt collectors can also help recover money that has turned into bad debt. Our staff get in touch with you, take a look at the records and decide the most suitable modus operandi with your consent. We understand that your needs may be specific and your worries might burden your mind, slowing down your progress speed. A debt collecter form UK Debt Collectors take care of your business needs while taking complete care that you sleep peacefully as our staff works with dedication and passion. To take away your worries, we present exhaustive plans of action with no legal loopholes. Our success rate depicts the swiftness and confidence with which we execute our plans. We are always with you no matter where in the World you are. With our free online portal, our debt collerctors are always just a click away. You can control the recovery process easily by posting instructions and can also steer it in the direction you wish to go. To keep you updated at every step, quick updates are posted by a debt collector about the recovery progress as soon as we receive them. All you have to do is sign up to our free portal and receive your login credentials. As soon as your registration is done, you will receive an email from our debt collector which will put you back to helm of your own finances. We offer the most reasonable rates currently available with services that have no parallel in terms of quality and value for money. We at UK Debt Collectors believe that money is not the end but a means to do more work. Our motivation is in your satisfaction and you will see it when you give us a chance. When you hire professionals to do a job, you do expect 100% satisfaction as you are paying for it. At UK Debt Collectors believe that satisfaction is not just an outcome of effective debt recovery. It is much more. The way we conduct ourselves and the way we treat our clients and their clients shows the respect that we have for our jobs. We offer value for money like no other firm and that is UK Debt Collectors USP.